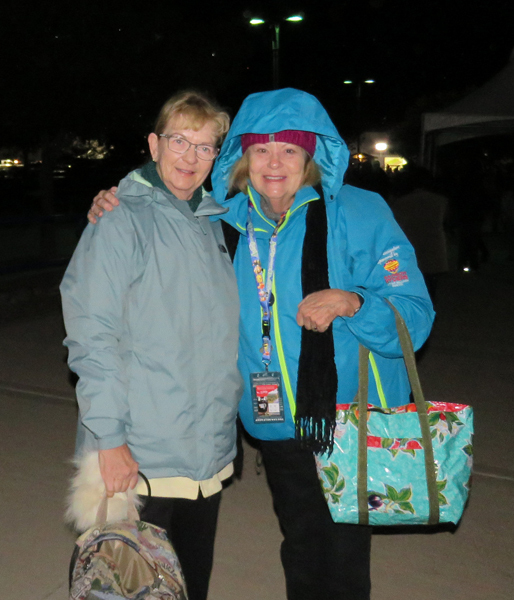 Fortunately Thursday was not as cold as Wednesday had been but still nippy at 42F. More people had arrived and the shuttles were full. We ended up taking one coming into the park but between us and others doing the same we were quickly full and after a half loop of the RV park we were headed to the field. Somehow I ended up chatting with the lady across the bus aisle from me. It was a short 8 – 10 minute ride to the drop off area but we covered a number of subjects. At one point she said that she knew a Canadian that went to Mexico and who wrote a blog. I looked at her and said that my name was Contessa. She fell back in her seat and screamed. It was Cheryl Cox who writes the blog Desert Diva. We have been reading each others blogs for several years as well as corresponding privately re various subjects including our pets and their various aliments. What a surprise! Sadly we did not have much time together as Cheryl is volunteering and had to check in. She was supposed to come visit that afternoon but never made it. You never know where or when you are going to meet a blog reader. Dawn Patrol had just taken off as we arrived. 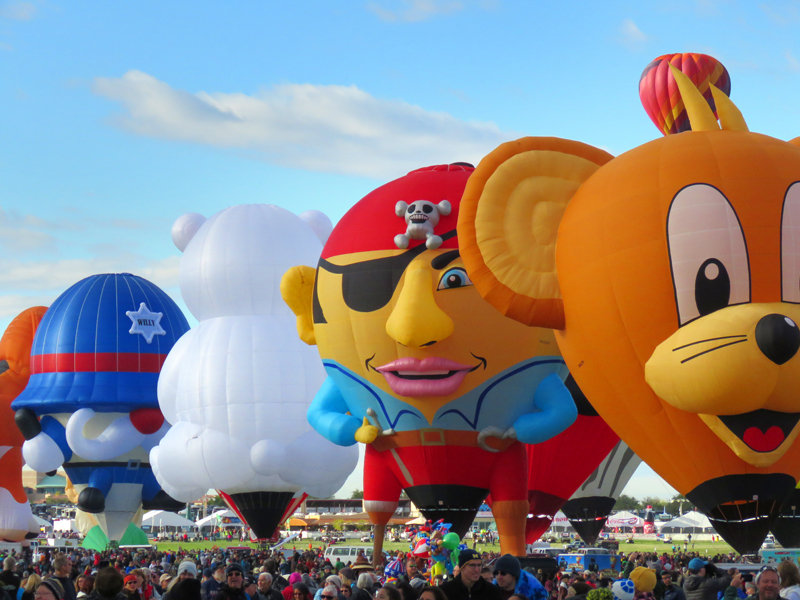 Today was the Special Shape Rodeo or the first day of special shape balloons. Everyone was getting their balloon ready. First time we saw this clown. The other side of this balloon is a sad face with a frown and tears. It was also Kids Day and not a good place to be if you don’t do well in crowds. It was a spectacular day. There were hundreds of balloons taking off all around us, not just the special shapes. Seven to twelve would go up at the same time and then another group would ascend. So fun to be in the midst of it all. 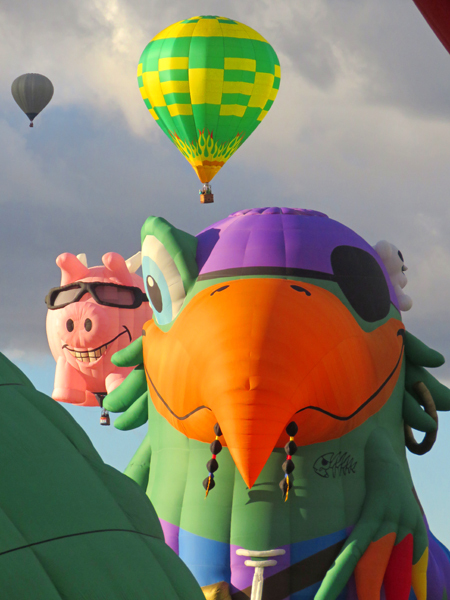 “Snobird” on the left from Palmer, AK ( that is how they spell the name of the balloon ). “Chic – I – Boom” from Crooks, SD on the right. “The Little Bees”. “Joey and Lilly” featuring “Joelly The Baby Bee “. Joey and Lilly are 98,000 cu/ft and Joelly is 56,000 cu/ft. Pirate Jack from Newport Beach, Ca. The sun burst through the clouds adding color to the balloons. That is “Great Eggspectations” flying over my head. 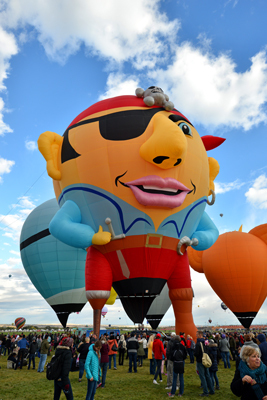 The flying goose is an Albuquerque balloon piloted by a medical doctor. 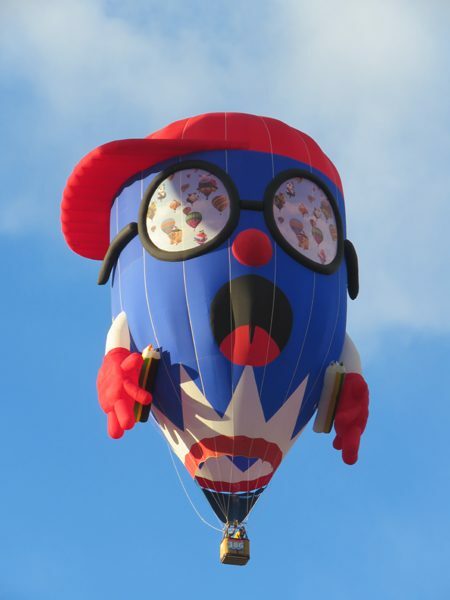 I asked and was told that there were only 568 balloons registered this year, the largest hot air balloon event in the world. 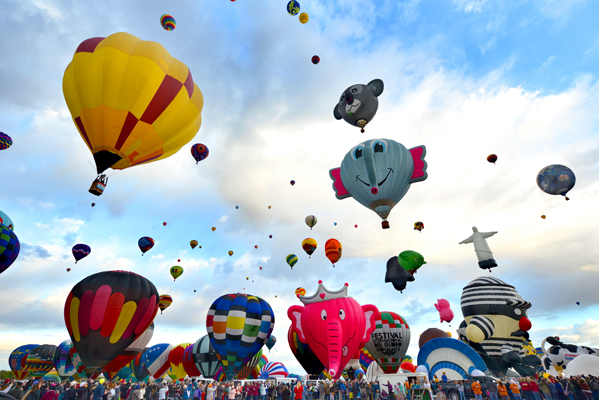 At one point in 2010 they had 1000 balloons at the Albuquerque International Balloon Festival. They are now trying to keep it at 600 or under as there is not enough room for all the balloons on the field. There is talk of expansion. 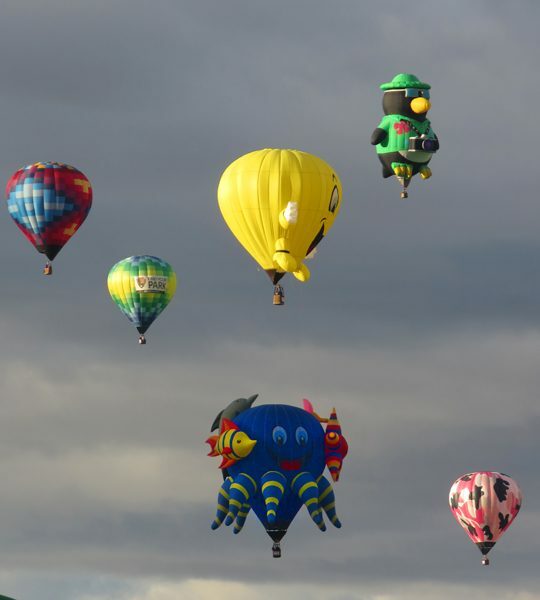 We saw hundreds upon hundreds of balloons fly off yet we did not see four of the new shapes for this year. Perhaps they did not make it. One was from Australia, two were from Brazil and the other from Florida. 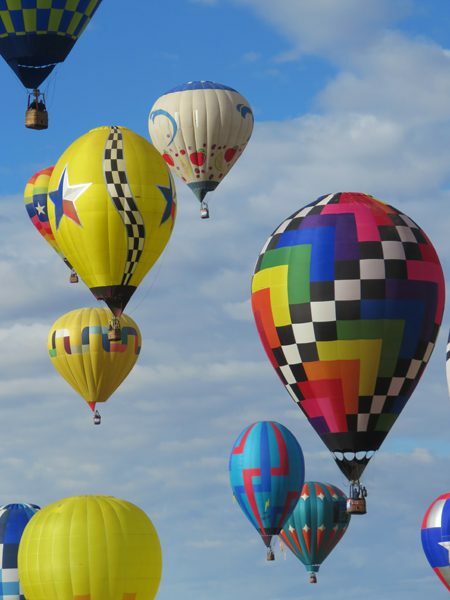 What made Thursday morning extra special was how the balloons would ascend, fly in one direction, go higher and catch a different air current back. It was a morning of perfect winds. 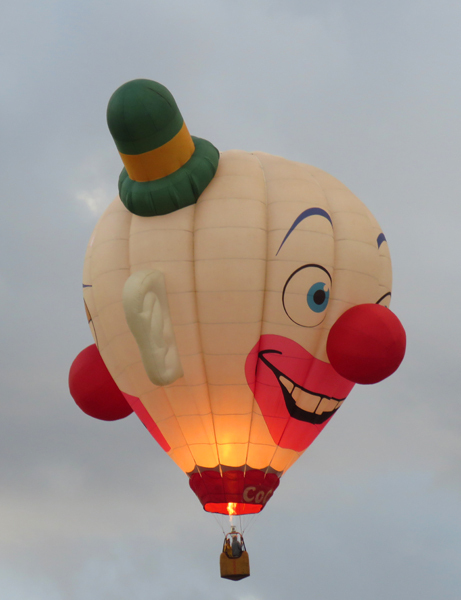 This is called the Albuquerque Box which keeps the balloons overhead. Have a look at the 90 second video that shows how this Box works. Albuquerque’s weather helped make it the Balloon Capital of the World. 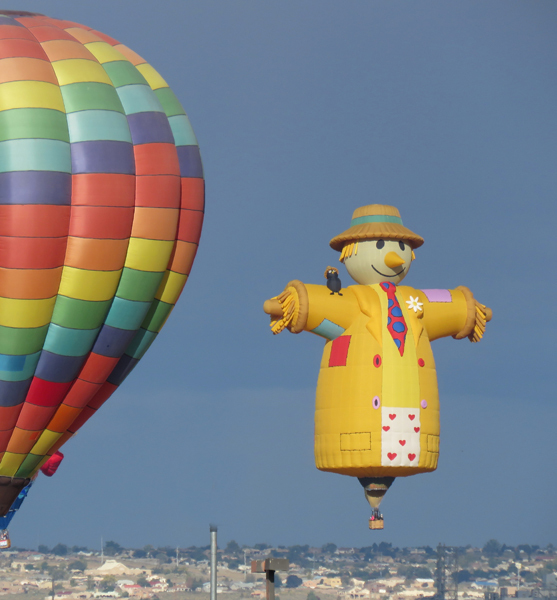 The Albuquerque Box wind pattern allows balloonists to easily make a round trip with a simple change in altitude. Eventually some of the balloons landed back on the field. 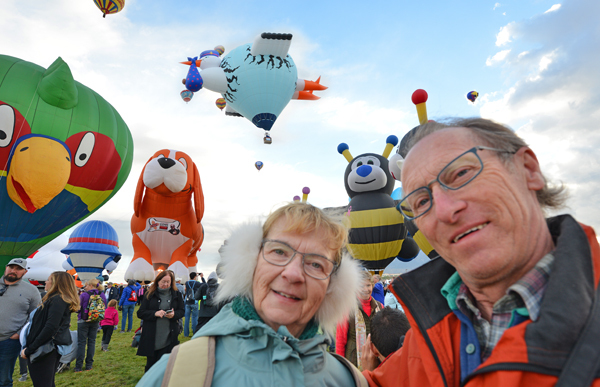 We had a great morning enjoying the balloons and then walked from one end to the other, checking out the vendors and food booths. We picked up a few souvenirs and had a snack before heading back to the RV. For those keeping track, we should have check out by 11AM, instead we had a relaxed morning and only got back at 10:30AM. On Tuesday we had been able to extend our stay for just one more night. We had not seen the Twilight Twinkle Glow nor the Balloon Glow due to cancellations because of wind and tonight would be the perfect ending to our stay here. 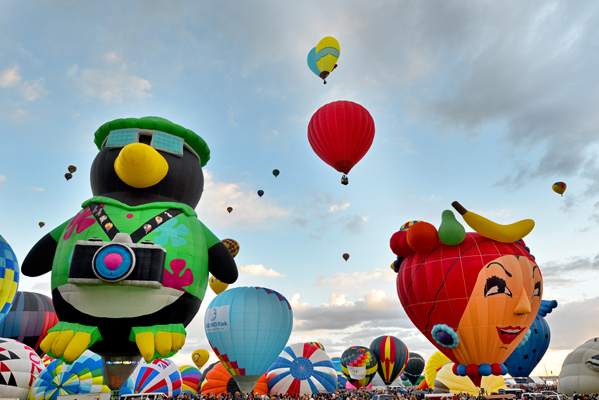 The Special Shape Glowdeo would only be for the 78 special shaped balloons plus the regular round Canon balloon as they a sponsor of the balloon fiesta. We spent the afternoon packing up for our Friday morning departure. We were surprised when we got to the field that yet again nothing was happening. Everything was on hold due to the yellow flag. There was a breeze that wavered between 9 – 12 mph. We were speaking with a balloon crew supervisor who explained all the details to us and even showed us how his wind indicator worked. 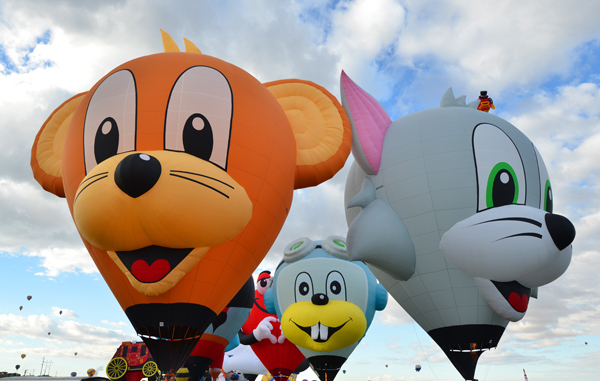 Because these balloons were special shapes, some very large, others top heavy and awkward the wind needed to be 5 mph or lower in order to have a static display and to do the glow. At least the sunset was memorable. 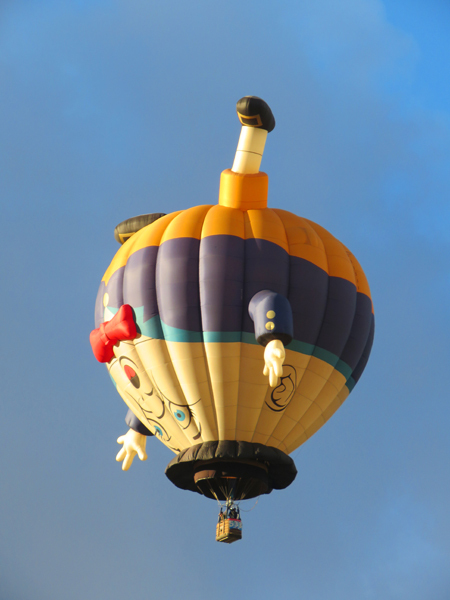 So we hung out and spoke with a few balloonists until 8PM ( we had been there for just over two hours – waiting ). 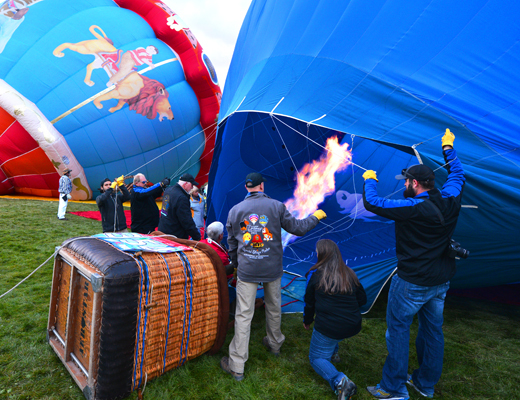 Slowly a few vehicles with balloons and crews began to leave the field. I noticed that the yellow flag was down but neither the green nor red flag replaced it. 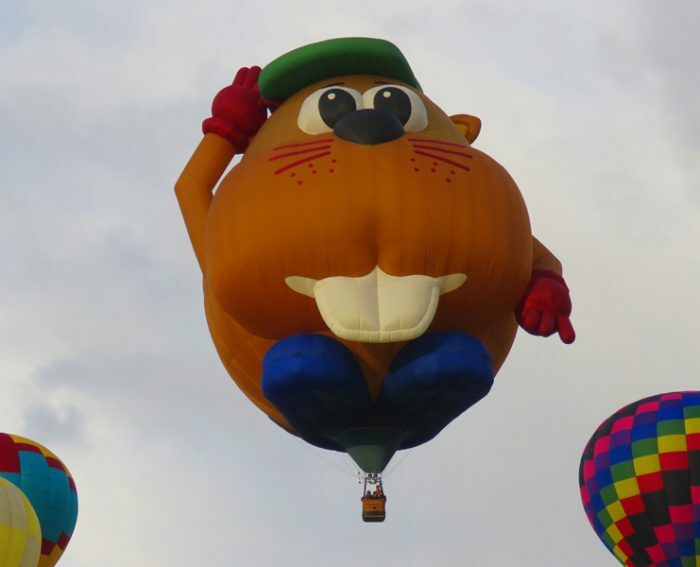 By now it was full dark and the lady I was speaking with from the “Fish” balloon said that the glow would not likely happen due to the wind, plus they had to be back by 4:30AM Friday for Day 2 of the special shape balloons. Everyone, balloonists as well as the crown, were disappointed. We left and got back just before 8:30PM, in time to sit and watch the exceptional fireworks from the warmth of the RV along with a glass of vino. Certainly not the way we expected to end our final evening in Albuquerque. WOW, ANOTHER FANTASTIC DISPLAY OF DIFFERENT AND FUN SHAPES. 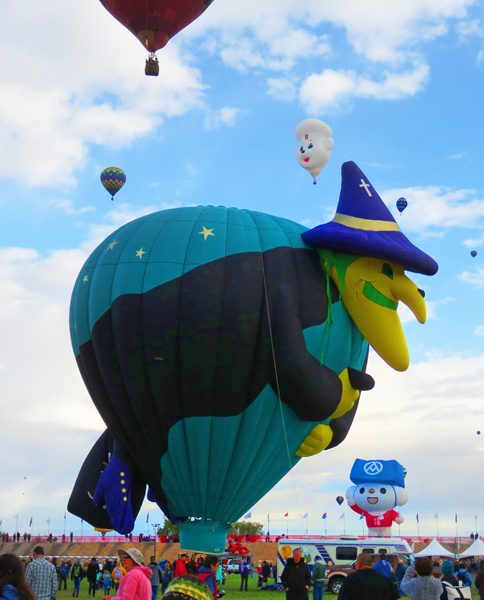 I’LL HAVE TO CHECK MY PHOTOS, BUT THAT WITCH NEAR THE TOP CERTAINLY LOOKED SIMILAR TO WHAT SKIP AND I NICK NAMED AS THE “WICKED WITCH OF THE WEST” AS SHE’S ALWAYS AIRBORNE DURING OUR BALLOON FEST IN HAVASU. TRUST ME, NOTHING LIKE THIS AT ALL. THIS IS THE WORLD’S LARGEST. TOO BAD THE NIGHT GLOW DIDN’T HAPPEN. KNOW IT’S A LOT OF WORK FOR YOU TO POST ALL THESE PHOTOS, BUT WE DO APPRECIATE YOUR TIME AND DEDICATION. 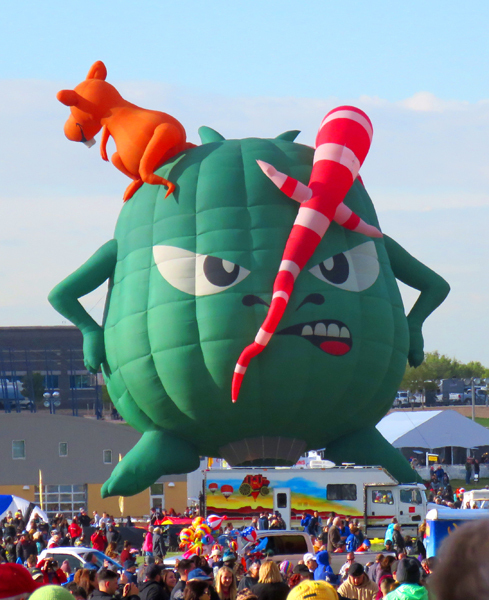 I do know that the balloon was called the Wicked Witch. Thank you, yes it takes hours to do posts like these. Mostly because we have to choose from many many photos. It is also a labor of love for us as I know that one day when we can no longer travel I will be able to relive this experience through my blog. Nice that you got to meet Cheryl such a small world. Gotta love all those special shapes balloons. Hope her tooth issue gets resolved today at the surgeon. Sounds like you have a very nice day. again. Thanks for the pictures. Thanks for the update on Cheryl. I had no idea. 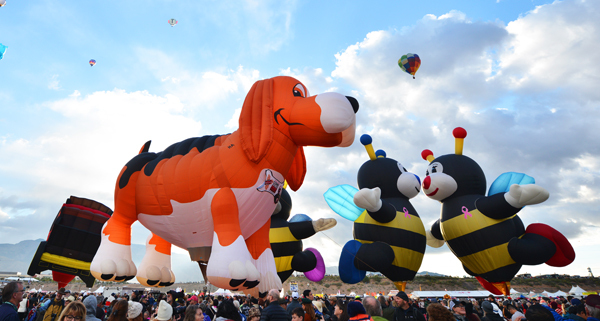 We loved the hound balloon as well. It never flew but perhaps in perfect conditions it might, it is huge. 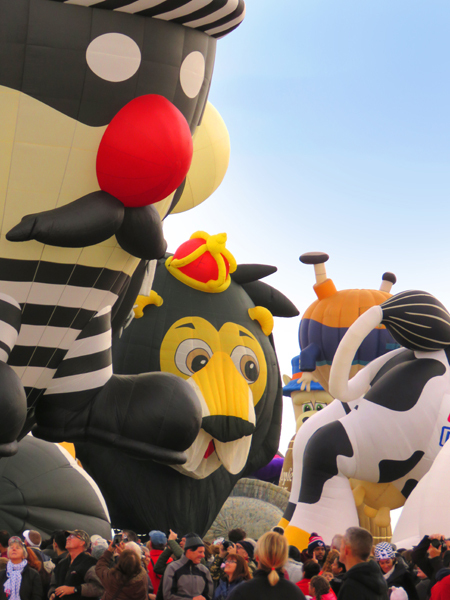 Can you imagine seeing 1000 balloons as there were in 2010? I never realized how big this event actually is. A huge amount of planning. They are all so colorful and unique. Thank you for sharing all the photos. You are most welcome. This is a bucket list item for many many people. There is a Facebook page that you can watch live videos from or go back and see what you missed. 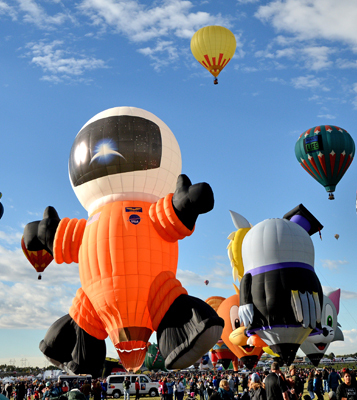 https://www.facebook.com/balloonfiesta/ The fiesta is always the first weekend in October. A stunning riot of colour, great pictures! Thanks for sharing and taking the time out to blog about it. Thank you Peter for taking the time to comment, it means a lot and a great sign of your appreciation. We plan to get back there on day, first we have to knock a few other items off the to see list. So glad that you enjoyed the posts. Beautiful pictures. So glad you’re having a good time! Thanks Linda, we truly are having a great time. Hard to be traveling without the girls but we realize that this is our time. This is a fun event!! 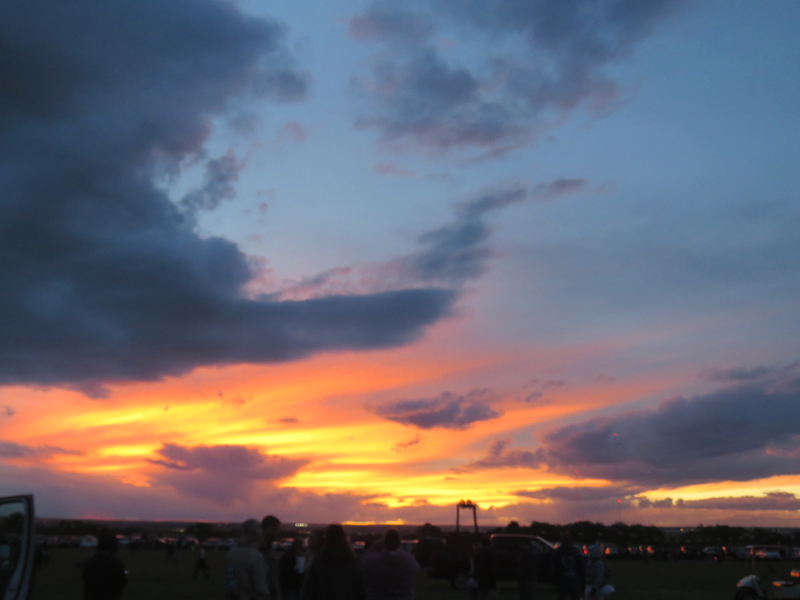 So many beautiful photos – thank you both for sharing. 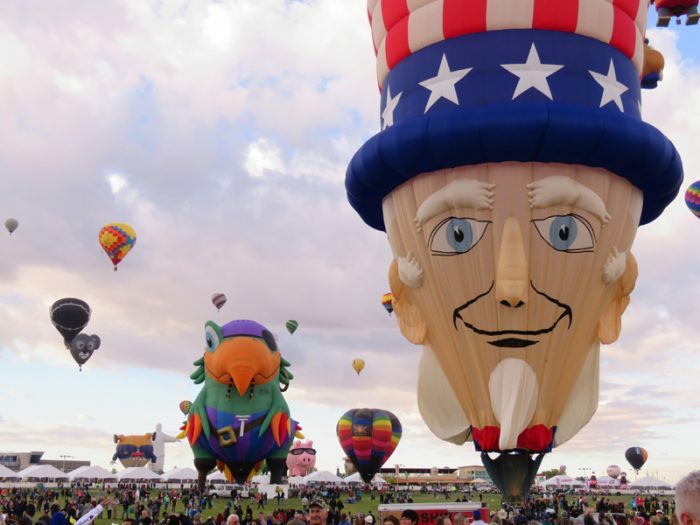 It has been 8 years since our last Balloon Fiesta and still so many of the same balloons and really love some of the newer ones like VanGogh – have always like the “Uncle Sam Balloon and love the little upside down frog. Thank you for the information on Van Gogh enjoyed reading it – that is a beautiful balloon. 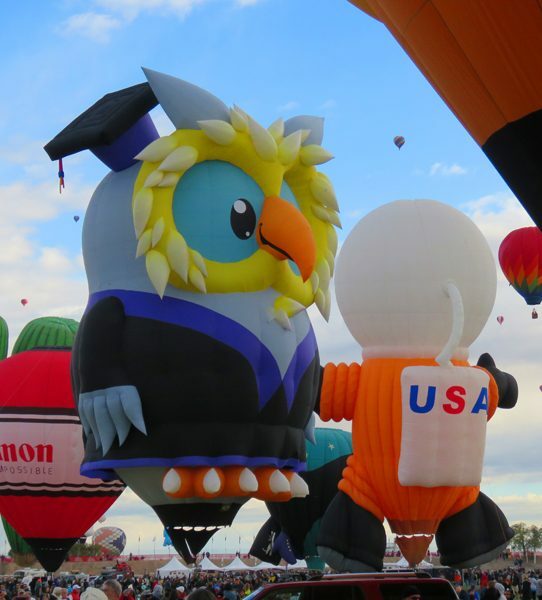 Sure have enjoyed each post on the Balloon Fiesta and excited for your next adventure. 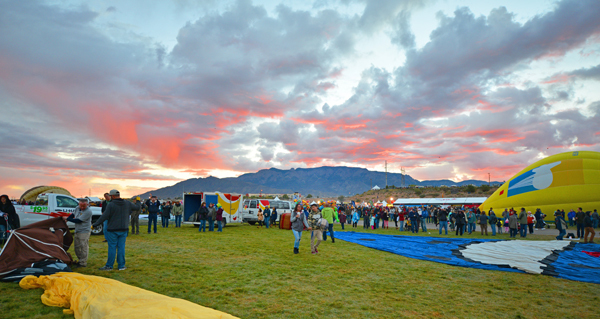 Wow, how many times have you been to the Balloon Fiesta? Difficult for us Canadians as we can only be out of country for so many months which means we have to leave the heat of Mexico so much sooner. Three times and it is just as beautiful each time. I hope we can make it at least one more time. Thanks again for sharing so many great photos. I hope that you and Rex make it one more time as well. Such a magical place. 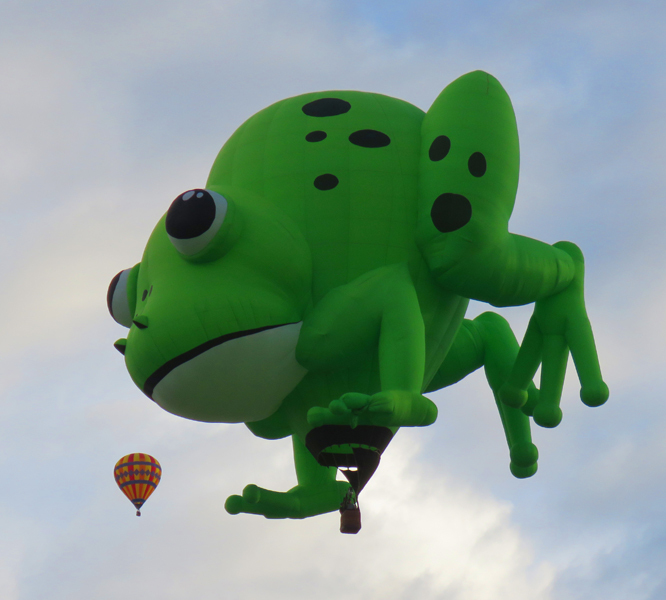 I sure did love the balloon fiesta pictures!! They were all so bright and cheerful! I hope you had as good of a time as it looked from the photos!! We absolutely loved being there.